The MANUAL Reset GFCI 25080-123 is 25 feet long with Quad Box and is designed to be used by professionals for their safety on the Job Site - Technology Research Corporation GFCI Inline Cord Set 25080-123 is 120V/15A or 120V/20A and 25 feet long. Cord Gauge is 12/3 AWG for maximum strength and durability. Ideal for use by contractors and industrial maintenance personnel working with extension cords or portable tools. Provides compliance with National Electric Code (NEC 2008) Article 590.6 for Temporary Installations. Applications include: High Pressure Sprayer Washers, Power Tools, Drain Snakes, Pumps, Construction Sites, Industrial Appliances. 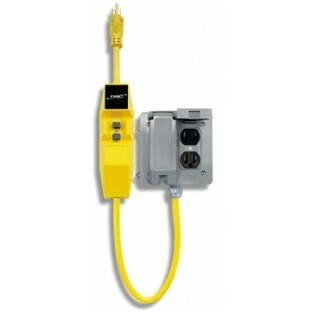 The TRC GFCI is Rainproof rated, UL listed for outdoor use. Cord lenghth is 25 feet with Quad Box. Voltage rating is 120 vac, amperage rating is 20, trip level is 4-6mA and has standard NEMA 5-20P & (4)5-20R plug and receptacles. To prevent unmonitored equipment startup, manual reset is required after GFCI trip and power outage. The TRC part number is 25080-123.